This video is very good and displays verifiable testimonies and information, giving quite a large sum of information regarding Jasenovac. As for the figures of people killed in Jasenovac, of which the video is daunted to show--they are highly contemporary. For the first account, given by the state-commission of Croatia, revolves around 500,000, while a short Croatian-based revision aims to illustrate a sharply smaller figure, circulating some 100,000 dead. These estimations, however, are clearly underestimated, whereas others, that derive of "Serbian nationalism", as in the microfilm of which the pictures in the video are extracted, are clearly overestimated (840,000) or so. The logical conclusion revolves around 200-500,000, and more so around 300-400,000. הסרטון דלעיל טוב מאוד ומציג עדויות ומידע קבילים, ונותן סך רב של מידע על-אודות יאסנובאץ. באשר למספרי הנספים, שמהם הסרטון נמנע כלל ועיקר-- הריהם פולמוסיים מאוד. החשבון הראשון, הנתון מעם וועדת-החקר הממלכתית דאז, סב סביב 500,000, אולם ביקורת קרואטית בהולה מכוונת לבסס מספר קטון בצורה חדה, הסובב כ-100,000. הערכות אלו, אם זאת, ממעטות, בעוד שאחרות, הנובעות מ"לאומנות סרבית", כיוצא במיקרופילם ממנו נלקחו הצילומים בסרטון דנן, הינן הגזמות-בעלמה (כיוצא ב- 850,000). המספרים המתקבלים על הדעת מכל, הינם בסביבות 200-500,000 ועוד יותר, כמדומני, בין 300-400,000. Memoria Jasenovacis mortuorum Vivat Eterno. May the memory of Jasenovac's victims live ever. לו יחי זכר נספי-יאסנובאץ לעד. See Jasenovac and related articles in wikipedia. The precise number of Serbs killed in the Jasenovac complex has never been established for a variety of reasons. One reason is that the full truth of Jasenovac would destroy the Yugoslav idea. 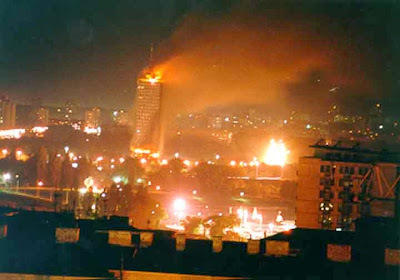 The Communists walked a tightrope between seeking to keep the Serbs in general subordinate within Yugoslavia, but also suppressing the Ustasha emigres who fought for a restored NDH. If Jasenovac remained a mystery, it could be used for political purposes or shelved, at convenience. Yugoslav population in 1941: 12 million; number of Serbs west of the Drina: 2 million. Yugoslavia's population in 1991: 24 million; number of Serbs west of the Drina: 2 million. Every other Balkans people that's complained of "genocide" (or multiple, even) has nonetheless seen a net increase in their numbers - except the Serbs. Where did you get the demographical information from 1941 and 1991? The 12 million figure is probably too low (that was from the 1921 census, and the 1948 census came in at just over 15 million, after all the wartime casualties), but I recall reading "The National Question in Yugoslavia" by Ivo Banac (Croat) who analyzed the 1921 census to come up with just over 1.6 million Serbs west of the Drina. The modern figures are from the 1991 census, of course. Vojvodina should be included as well since it was also under NDH control. The only numbers I could find from the 1931, 1948 and 1991 censuses are from Wikipedia. They show (between 1931 and 1991) a drastic surge in population for Muslims, a gradual change for Croats and a very small change for Serbs... until you consider Vojvodina in which case the increase for the Serb population is around 10% less than for the increase for the Croat population which in turn is around 70% less than the increase for the Muslim population. Keeping in mind that the Krajina Serb population not only stagnated but also decreased by 50,000 or so between 1931 and 1991. I have no idea how accurate these statistics are since the articles don’t have sources. Minor quibble: only a portion of today's Vojvodina (Srem) was under the NDH; the rest was annexed to Hungary or administered by the Germans.